In this lesson, students explore real and imagined journeys by analyzing the life and artworks of Joseph Yoakum. Students then write narratives and create artworks of their own real or imagined journeys. How can art take you on a journey? How can a real journey and an imagined journey be similar? How can they be different? Words and images can take you on a journey of the imagination. Writers and artists find rich, specific details to describe both real and imagined experiences. Students will integrate and evaluate content presented in diverse media and formats, including visually, orally, and in written texts. Students will write narratives to develop real or imagined experiences or events using effective technique, well-chosen details, and well-structured event sequences. Students will develop and strengthen writing as needed by planning, revising, editing, rewriting, or trying a new approach. Guide students in a quick-write: Take five or ten minutes to have students respond to the following questions in their writing journals. Tell them to write down whatever occurs to them without worrying about spelling or punctuation. What would you see or do once you arrive? Develop a class definition of “journey”: Discuss the meaning of this term with the following questions. Then use students’ responses to develop a class definition. Post it in the classroom for reference throughout the unit. What criteria distinguish a journey from just taking a trip or traveling somewhere? Would the trip you described in your quick-write be considered a journey? Present a poem: Project Brian Patten’s poem “Geography Lesson” (http://www.poetryarchive.org/poem/geography-lesson) and have students listen to the audio recording. Ask students to close their eyes as they listen and imagine the different locations described in the poem. What do they “see” in their imagination? Then have students listen a second time and record the adjectives and phrases that are used to describe the different places. Students might notice words and phrases like warm blue sea, narrow and gray, sweet-scented jasmine, and green leaves burning. Project the text of the poem and invite a few students to read it aloud, each reading a different stanza. Have students continue to look for details that help them “see” these places better. Remind students that poems should be read multiple times. Each reading reveals another layer of meaning and allows the reader to focus on a new set of details. Have students sketch their impressions of the places described in the poem: Tell them to return to the text to find additional details to use within their sketches. Post students’ drawings or have students share and discuss them in small groups. Conduct a close reading of the poem: Discuss the following questions, which require students to return the text to articulate and defend the choices they made in their drawings. These questions also require students to determine the theme of the poem. If you haven’t been to the places described within the poem, how do you know what they look like? What specific words and phrases in the poem helped you with your drawing? Why does the speaker in this poem now “travel to where the green leaves burn”? In what way did his teacher’s experience impact him? How do you know? Do you think it’s possible to “long for” a place you’ve never actually visited, as the teacher in the poem does? What message or lesson does the poet reveal through this poem? What specific words and phrases in the poem support your response? Why do people take journeys? Would someone ever travel to a place just because of the landscape or scenery? Can you give an example? Have you ever wanted to visit a place based on how someone described it? What are the first details you notice about these artworks? How are they similar? How are they different from each other? These images are landscapes. Landscapes are works of art that depict scenes from nature. 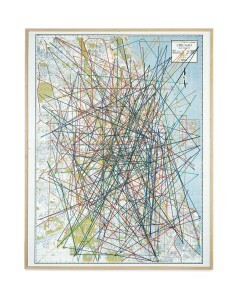 Describe the places that the artist is depicting in these drawings. What colors does Yoakum use to represent these two places? What details does Yoakum include about these places? What details are not included that you would expect to see within a landscape? What feeling or mood do you get from this artwork? What details make you say that? What drawing materials did Yoakum use to create these artworks? How does his choice of materials affect your impressions of these landscapes? Now that you’ve read about Joseph Yoakum, how does knowing more about him help you think about his art? What kinds of journeys did he take in his life? What compelled him to take those journeys? In the poem “Geography Lesson,” Brian Patten talks about the places that his teacher visited “in his mind’s eye.” What evidence does the text provide to show that Joseph Yoakum may have visited the places he portrayed in person? What evidence shows that he may have visited them “in his mind’s eye”? 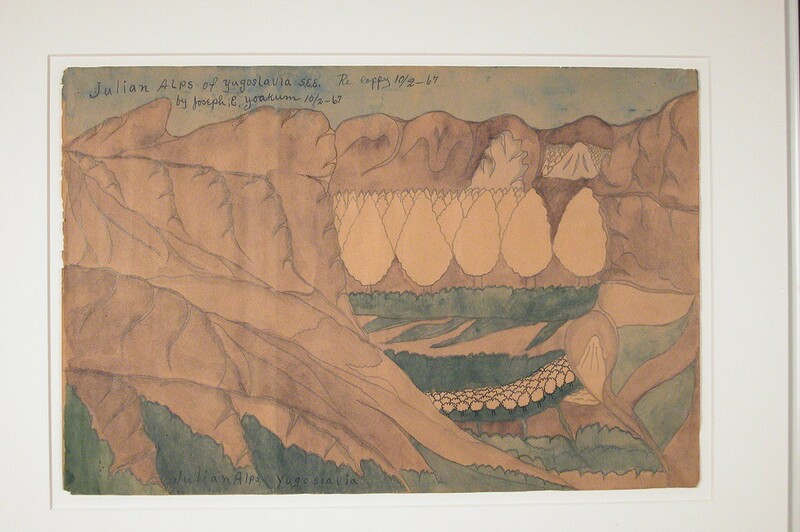 How do you think that Joseph Yoakum felt when he sat down to draw the places from his adventures (real or imaginary)? What do you think the artist wanted to communicate? What do you see in the artworks that makes you say that? Do you think that imaginary journeys and adventures can be just as exciting as real ones? How would you represent an imaginary journey to make others want to go on it too? What kinds of details would you need to include? Record students’ responses to this last question as a reference for the narrative writing activity that follows below. Have students collect landscape images: Either in class or as homework, have students search for a landscape photograph that depicts either a memorable place they have been or a place they dream of visiting. If possible, students should not appear in the photo. Ideally, students should find their landscape photos on the Internet and either print them or send you the picture files so that you can project them. Present the narrative writing assignment: Explain that each student will use the photograph that he or she has collected to write a brief first-person narrative of a real or imaginary journey. Whether the journey is real or imaginary, the narrative should be written as if the student has actually been to this destination. The narrative should include rich, descriptive details. As an option, prior to drafting their narrative, students can conduct research to find out more about the places represented in their photographs. Details about the climate, physical features of the land, native plants and animals, and local history can be compiled and used to enhance their narratives. Have students plan and draft their narratives: Have students pair up and take a few minutes to describe their photographs to each other (where it is, what is unique about this place, an adventure they could have in this place). However, they should not reveal whether they have actually visited this place or not. Then allow time for students to write their narratives. If you have been studying the conventions of narrative writing, this would be a great time to review those conventions. Remind students to include descriptive language in their writing. Remind them of when they closed their eyes to “see” what was being described when they listened to “Geography Lesson.” They should write as if they are describing each scene to someone who cannot see it—painting a picture with words. Note: If students have limited experience writing richly detailed narratives, consider identifying one or two texts that can be used as models. These should be shared with students before they begin drafting their own narratives, and students can identify how the authors of these texts used vivid language and specific details to draw the reader in to their journeys. What details do you most remember from the journey narratives within your group? Did you think that it mattered whether the author had been to the places described? Did it affect the details or your interest in the narrative? How did each author’s choice of words help you understand his or her journey? Give some examples. 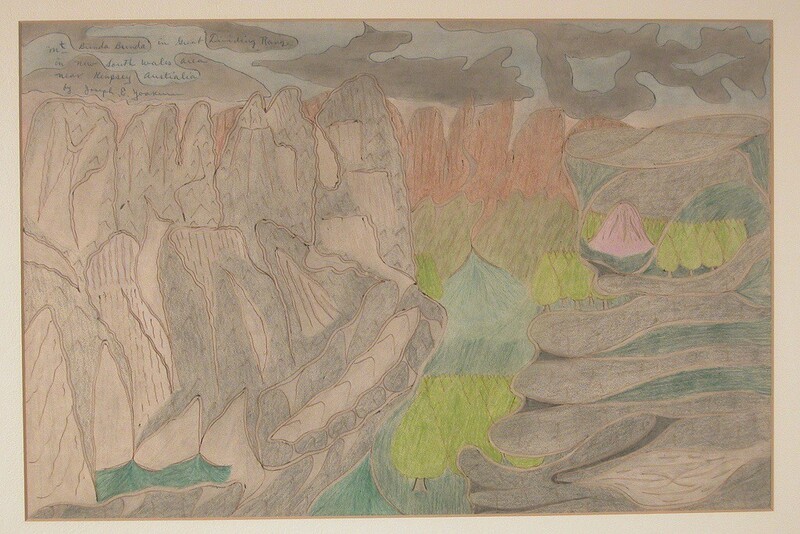 Why might Yoakum have chosen to paint these landscapes the way he did? How did his artworks and the choices he made when creating them reflect the way he might have felt about these places and the aspects of these places he most wanted to remember? Tell students they will create artworks of the journeys described in their narratives using the simple materials that Yoakum would have used, such as ink pens to outline forms in the landscape, and pastels, watercolors, or colored pencils or markers to fill the forms in.. As they do this, they should consider the ways in which Yoakum emphasized or de-emphasized certain elements of the places he represented. What feelings, memories, or hopes do they want to convey through their artworks? Have students revise and edit their narratives: As homework or in class, have students create final versions of their narratives, taking into account the peer feedback they received. Note: Depending on your curriculum objectives, you may spend more or less time revisiting and revising these narratives. Share your assessment criteria with students, and consider the amount of time they might need in order to fulfill these expectations. Lead students in a guided reflection: Have the students display their narratives and artworks in front of the classroom. Talk about their experience of describing these journeys in words and images. Do the artworks help you better understand each other’s narratives? What insights do they provide about your journeys? What details about the journeys can you learn from the narratives, but not from the artworks? How does this experience help you think about Joseph Yoakum’s artworks and the choices he made as an artist? Were you able to determine whether a journey was real or imagined based on the text? 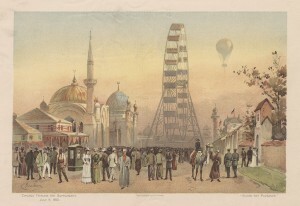 The illustration? Why or why not? Does this matter? Look at the class definition of a journey. Do you have anything to add or modify in the definition? Ask students to choose one of Joseph Yoakum’s artworks and to search online for a photograph of the place that he chose to portray. Have students write a comparison/contrast paragraph that describes the similarities and the differences between the two images. Intuit: The Center for Intuitive and Outsider Art. “Resources for Teachers.” Accessed November 25, 2014. http://www.art.org/education/resources-for-teachers/. Intuit: The Center for Intuitive and Outsider Art. 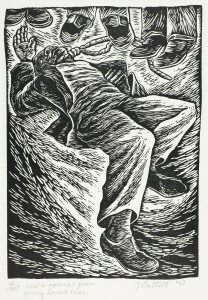 “Yoakum, Joseph.” Accessed November 23, 2014. http://www.art.org/2014/06/yoakum-joseph/. Pascale, Mark. 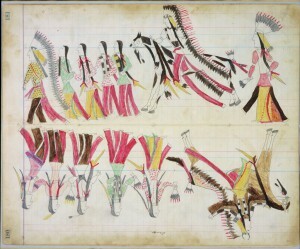 “The Picture Tells the Story: The Drawings of Joseph E. Yoakum.” Reprinted April 4, 2009. http://www.tfaoi.com/aa/8aa/8aa524.htm.